Well hello and welcome once again. I am feeling quite chuffed to have found a little more time to spend in the craft room. This time I couldn't resist playing with the stamps from the latest edition of Creative Stamping. The stamps are just fab and the elephants go so well with the elephant stamp I already have perfectly. This is based on a card I made a while back so just had to put them together. 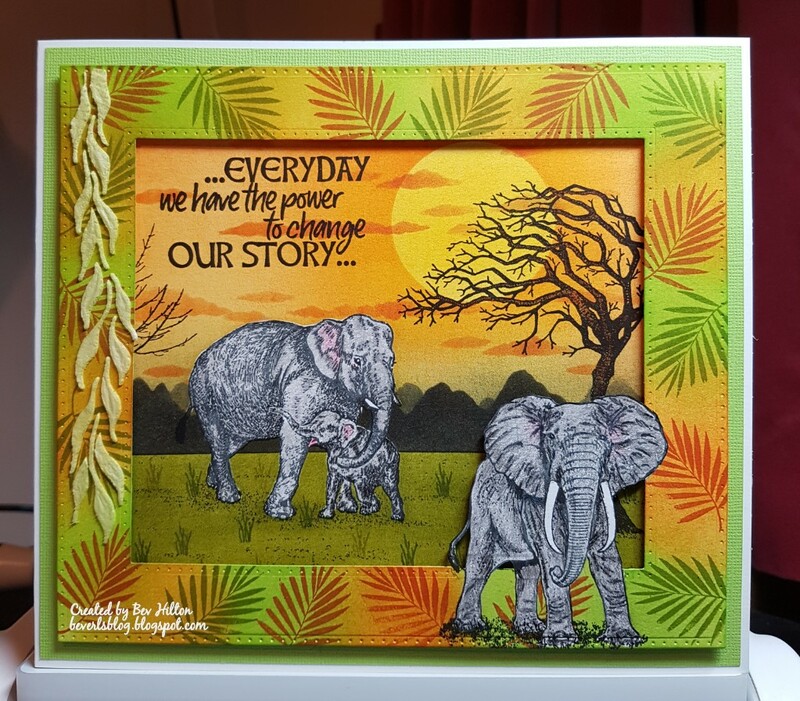 I began by workng out the size I needed to create by scene at the same time as working out which dies I would need as I wanted to cut a frame which would have a depth deep enough to incorporate the elephant. In order to have the elephant as part of the frame, stamp the elephant onto the card first using the versafine ink. Place the die over the top and work out the placement. Using a sharp craft blade, gently cut around the elephant to enable you to tuck the die behind the image and tape in place with low tack tape and then run it through the die cutting machine. You will now have a nice frame with the elephant as part of it which will allow him to stand out from the finished piece. 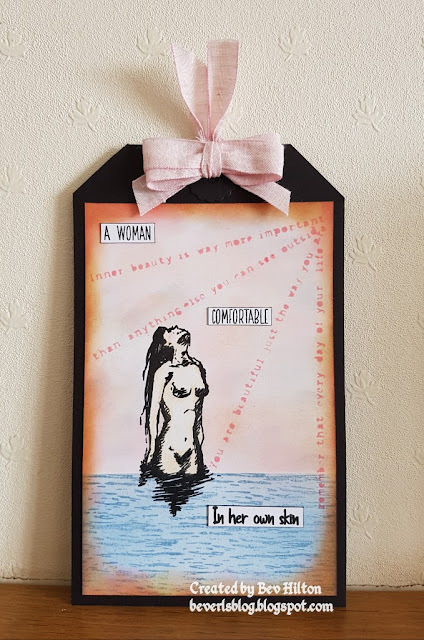 Using a die from the middle of the two used, cut this onto an A4 piece of card and take out the middle to give you a stencil to tape down over your card stock which will allow you to work within and have a neat edge. Stamp the elephants from the Creative Stamping set onto the card and also stamp it onto masking paper. Carefully cut out and place over your stamped image. Take a piece of paper and lay across the card and begin blending over the greens to create the grass area. Once happy turn your paper round. Cut a mask to create the sun and then blend over the inks to create the sky. Remove the mask creating the sun and gently brush over with Mustard Seed until happy with the colour. Take the Reflections mask and brush through with the Black Soot distress ink across the card to create the mountains. Using the same mask move it around and blend through with the Weathered Wood distress ink to give a look of depth to your horizon. Take the Scenic Clouds stencil and using Rusty Hinge distress ink, pounce through with a sponge to create the clouds. Once happy with the blending and the scene is created, take the tiny grass stamp from the High Tide stamp set and using Fern Green and Crushed Olive ink, stamp it randomly over the grass area to create a feel of tufts over the field. Use the Cuttlola Dots Pen to add more interest and help ground the elephants. Take the Lavinia Stamp tree and stamp it to the right of the scene with the black Versafine ink and the tree from Inkylicious to the left so that once the frame is added just a small part will show. Take the verse stamp and stamp this top left. I felt the mountains were a little too crisp against the sky so I brushed a little Weathered Wood over the top to darken it slightly. Now happy with the scene it's time to work on the frame. Cut a mask and place over the elephant. Using the Twisted Citron and Spiced Marmalade, brush over the entire frame. Then take the leaf stamp from the free stamp set and stamp it around the frame in Orange Blossom and Fern Green. Take the Mini Moving Vines mask and push through the embossing paste just on one vine down the left of the frame. Blast with a heat tool so that it lifts and bubbles a little. This paste is great for this effect. Gently brush over the Twisted Citron. Now remove the masks from the elephants on both the frame and the scene and colour with shades of grey Polychromo pencils. Add a touch of brown to the tree and you're done. Mount the scene onto some matching green card, making sure you have a depth deep enough to allow a border once frame added. Use mounting foam to allow the frame to stand up from the finished piece and carefully place it onto the card. Mount onto your card base. I used an ivory card for this. Well that's enough typing...phew. A bit long winded so you may be bored by now haha. That's all from me and I hope you like it and maybe got inspired. Enjoy the rest of your week and see you all again soon.